With us today we have Janette Rallison, author of My Fair Godmother and My Unfair Godmother, among many others. She has five children who keep her well supplied with plot ideas, sometimes even making cameo appearances in her novels. She likes to write romantic comedy because there is enough angst in real life, but theres a drastic shortage on both humor and romance. 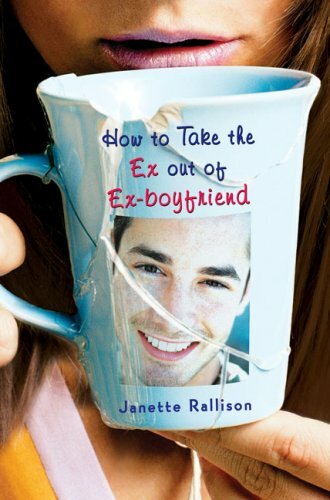 Stick around to find out how you can win some Awesome, courtesy of Janette! ~In the Fair Godmother books, bumbling “fair” godmother Chrysanthemum (Chrissy) inevitably seems to send her charges off into the past, into fairy tale settings (Savannah gets sent to the Middle Ages as Cinderella and Snow White; Tansy finds herself dealing with Robin Hood and Rumpelstiltskin): are there plans for this to be a long-running series, tackling many different stories? Series are always tentative things. They depend on how well the books do, but yes, there is at least one more Chrissy misadventure in the works. I mean, she’s got to get into fairy godmother school sometime. What I need to figure out is whether there will be just one more book, or a few more. ~Follow up: where did the idea for the series (and Chrissy) come from? Authors get asked to write a lot of things for friends and family members. I’ve done my share of school talent show skits, camp skits, etc. My Fair Godmother started out as a half an hour skit for my daughter’s church group. In fact, my daughter was the original Chrysanthemum Everstar. I had imagined the fairy as a no-nonsense, cynical, over-worked person. (Think Florence the sassy maid on the Jeffersons) But my daughter played the part as a dingy shopping diva, and Chrissy has been that way ever since. ~Why fairy tales? What is it that calls to you, personally, as a writer, and why do you think readers connect to them the way they do? Writing about fairy tales is great for a lot of reasons. We’ve all heard them, so we have a common frame of reference, but also, many of us wanted to be those fairy tale heroines. When I was little and people asked me what I was going to be when I grew up, I told them I wanted to be a princess. Alas, the whole royalty thing didn’t work out, but perhaps that’s for the best. When you think about Cinderella and Snow White, they had to do a whole lot of cleaning and cooking before they got to put on a tiara. I’ll stick with my dishwasher, washing machine, microwave, and hunky electrical engineer. ~What’s your favorite scene you’ve ever written? That’s hard to choose, because I’ve written a lot of books. My Unfair Godmother is number 17, I have a dragon book that’s coming out this fall, and I have two other books I’m working on right now. The Snow White scene in My Fair Godmother is one of my favorites though. I actually laughed out loud when I wrote it, and that usually doesn’t happen. The trailer scene from Just One Wish is also a favorite. Not only do Steve and Annika square off in a very creative way, but I also get to insult writers in the process. ~Can you tell us about anything you’re working on now? I have a dragon slayer book coming out in the fall, I’m polishing up a time travel/dystopia book, and I have about fifty pages left to write on a paranormal romance. The climax takes place in Egypt and so I had finally convinced my husband that we needed to go to Egypt for research. Yeah, I guess with all the political strife over there right now, that’s one trip we won’t be making. Did they have pizza in fairy tales? (maybe only the Italian ones . . .) I’ll go with strawberries. I love them. Strawberry was teased mercilessly as a child. “What sort of stupid name is Strawberry?” The other village children asked. Strawberry ran off to find a tower to hide in. After all, it had worked out pretty well for Rapunzel. The evil queen from Snow White. She had power, riches, and fame—yet all she cared about was beauty. That’s devotion to an ideal. The cosmetic industry would have loved this woman. Cinderella has always been my favorite fairy tale. Rags to riches, handsome prince, a ball where you get to wear poofy evening gowns—what’s not to love about that? Rumpelstiltskin is probably my least favorite fairy tale. What sort of woman trades her firstborn child for a roomful of gold? What sort of King threatens to kill a woman twice if she can’t spin straw into gold and then says, “Hey, I’ll marry you if you can do it a third time”? Is that a match that is going to live happily ever after? I think not. And why in the world does Rumpelstiltskin ask the queen to guess his name, and then stand around a campfire singing it out loud? Would that ever really happen? I’d choose to be Beauty from Beauty and the Beast. She had cute little magical servants to do the hard work, and all she had to do was fall in love with a hairy guy. A high tower—they have a better view. Besides, it’s hard to write with trolls around. I can’t walk in high heels, let alone glass heels, so I’ll have to go for the pumpkin. Dance, definitely. That’s my definition of a good night. Thanks so much for stopping by and being a part of Fairy Tale Fortnight, Janette! To enter: leave a comment with some love for Janette, and let us know why you want to read these books. Make sure we have a way to contact you! I am really interested in these book because they seem unique. I really haven't seen anything with fairy godmothers since Cinderella, and with all these cookie cutter books coming out it's nice to see something new. Totally, love the twist and would love the second book! Already have the first proudly on my shelves. I would love to win whatever Janette throws at me! Love the interview. I still love fairy tales! Fairy tales...would read it anytime.. These look like absolutely great books!! Love the covers and titles!! Love the fairy tale concept!! So cute!! Great interview! I'd go with the tower!! Writing seventeen books is seriously impressive! I've been meaning to check her books out. I'd love to read (win) her books because they sound fun and witty! have heard great things about this author! Great interview. 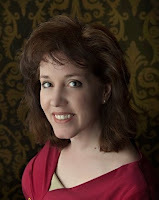 I'd absolutely love to read either of Janette's novels! I enjoyed reading My Fair Godmother and love reading fairy tales. I love the fairy godmother concept. Very unique. 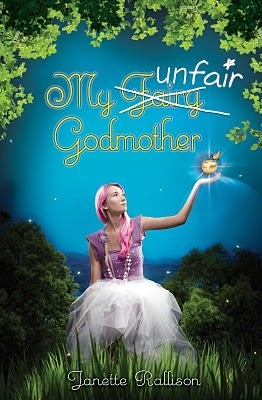 I'll love to read My Unfair Godmother. I love fairy tales!!! Plus, this book has been burning a hole in my wishlist for a while. Good luck on your dragon slayer book, I love dragons also!!! I agree Janette about the Rumpelstilskin being the worst fairy tale. I want to read these books so bad! Great interview! I love the line you wrote about "Strawberry." I totally agree you should write a book about her! I've read so many good things about these books and they sound awesome!! Thanks Janette :) I love this giveaway, both books look awesome!! How great these books look! I love the titles and so would love to read any of these! These book sound just like the books I love to read, with a healthy dose of sweetness, cuteness and humour. They sound like a fun light hearted read and one can always use a fun read. Great interview! The series sounds great--I'll have to check out those "misadventures"! Both of these books sounds very interesting! I love the covers too!